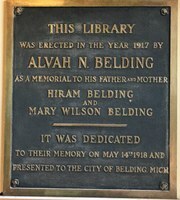 The Alvah N. Belding Memorial Library is a historic building recognized as a State of Michigan Historic Site in 1980. The building was placed on the National Register of Historic Places in May 1993. The Belding Brothers Company manufactured silk and silk thread and had several mills in Belding.